JVS design and manufactures drilling spool in accordance with API product specification API 16A. 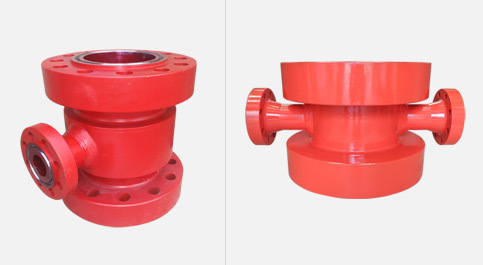 Drilling spools are designed to allow smooth circulation of mud during the drilling environment. Drilling spools are used for BOP hookup. Drilling spools usually have the same nominal top and bottom end connections. Side outlet may differ from each other. Top, bottom and side end connections can be hub end or flanged. Welding is done in accordance with the applicable API specification and ASME Section IX. Each spool is drift tested to ensure that access to the well bore is not restricted. Basic material of construction is alloy steel. Application of CRA (AISI 316L or Nickel alloy 625) enhance the corrosion resistance ability of ring groove, thus enhance the product life.